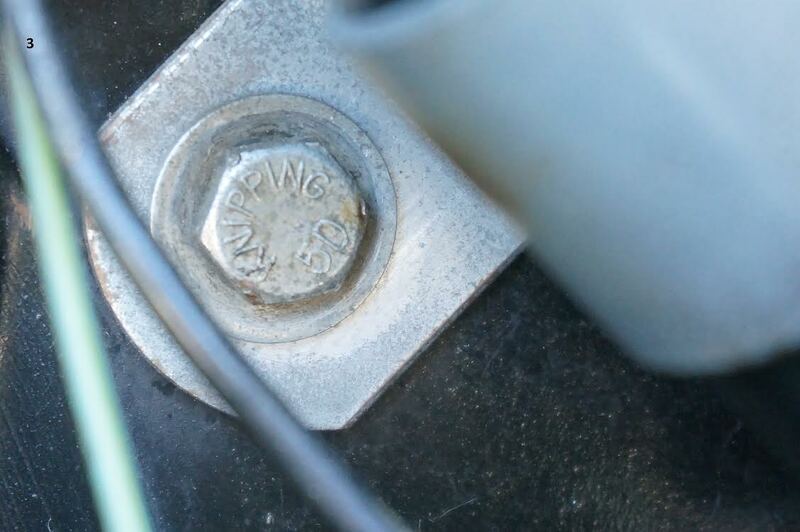 Reader Kevin Cook inquired about which Bolts to use with the Coil Bracket on his 1967 Beetle. Not having a ready answer, Eric and I began to ask some questions. I went to my bolt bins. I also made a call to David Brown of Pennsylvania. He and I discussed the possibilities, sorting bolts as we talked. Then, I recalled that another Reader, Richard Marcoux of Nebraska, has an unmolested ’67 Beetle. Richard and I spoke by phone and he agreed to take some photographs. Here’s what we concluded after much talking and searching of parts, etc. The Coil Bracket Bolt has a captive washer which measures approximately 16mm in diameter. The washer is this large so that it will more than cover the hole of the bracket. The large holes of the coil bracket allow for some adjustment on the shroud. Our collective finding is that the majority of bolts with this larger captive washer are either plain-headed (no brand name) or of the Knipping Brand. This is not to say that another brand might not have been used. But, we can say only that this is what our limited study uncovered. Interestingly, I found that the no-brand bolts were self-starting, whereas the Knipping bolts were not. Photograph #3 is an illustrative photograph from an unmolested 1967 SunRoof Beetle showing the Coil Bracket Bolt in place. The Generator Backing Plate Bolt has a small diameter captive washer which is just larger than the 10mm bolt head. There is no need for a larger washer because the hole is quite precise on the backing plate—it needs no allowance for adjustment. Again, as an indication of this finding, I post here an illustrative photograph from an unmolested 1967 Beetle. Photograph #4 shows one “ear” of the backing place with its bolt. Our collective finding is that the predominant brand of bolt for this application is KAMAX. The other brand which we found is Ribe. Again, with a larger study, other brands might be discovered. Here’s an example of my study for the Generator Backing Plate Bolt: I removed 35 bolts with captive washers from a bolt tray. I found 27 to be KAMAX and 8 to be Ribe. No other brand was present. While we were at it, we thought about other possible applications for this bolt. One could be the ends of the Fan Shroud where it affixes to the cylinder tins. However, the Official Volkswagen Parts Manual calls for the straight slotted screw (commonly called “engine tin” screw or “cheese-head” screw). 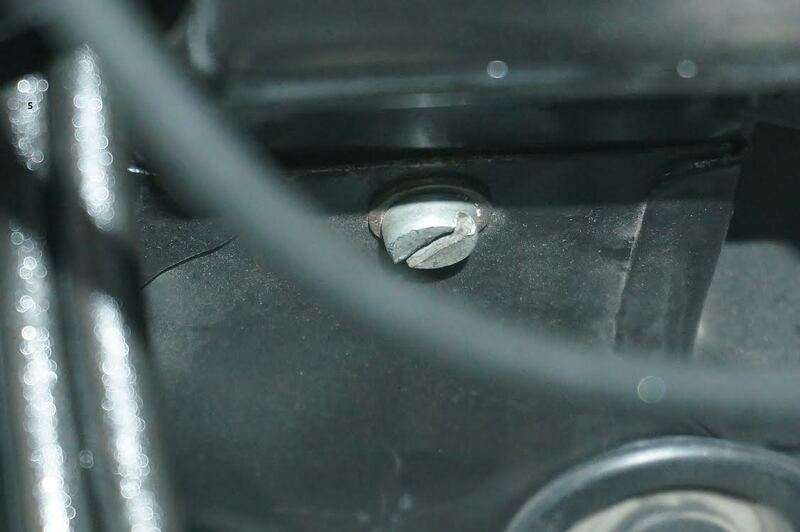 Although it is much more convenient to use one of the 10mm bolts described above, due to the limited space on either side of the engine (difficult to get a screw driver into that narrow space and still be able to turn it), the screw is the fastener of choice. To illustrate this feature, I post here photograph #5, taken from an unmolested 1967 SunRoof Beetle. And, by the way—the original sheet metal screws did not come with captive washers. Today’s replacement screws seem always to come with the captive washers. Several of us discussed the KAMAX “pot-of-gold at the end of the rainbow” theory. Why did VW use some KAMAX… seemingly “scattered” amongst other brands? Was there a pattern which this use of fasteners followed? 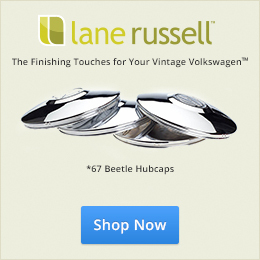 When did restorers begin to attempt to install all KAMAX bolts on their VWs? Why is KAMAX so “revered”? I fear that the answers to these questions may never be resolved. Here’s where you, the Reader, have the opportunity to impart some wisdom! In the end, we do the best that we can using the information available. Beyond that—the choice is ours. It’s the American way to restore the German Volkswagen! 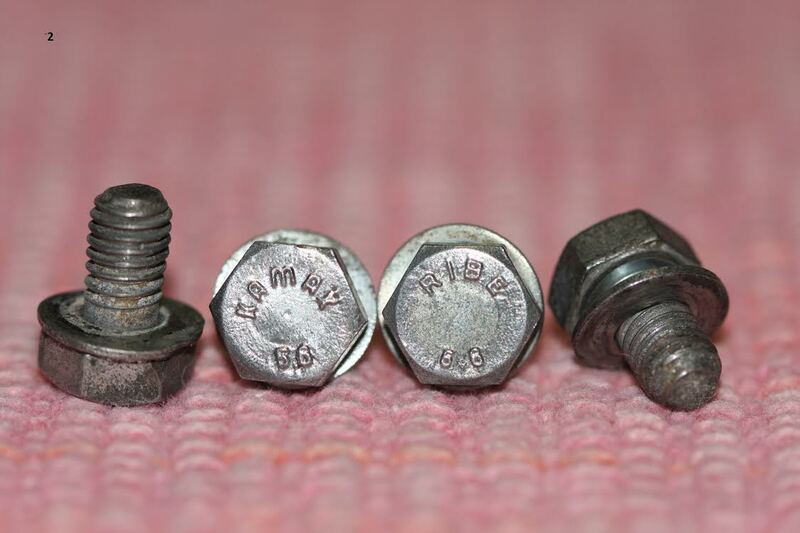 My thanks to Richard Marcoux of Nebraska for his input and photographs of the applied bolts and shroud screw. Richard conserves a 1967 SunRoof Beetle in original condition. He also owns one of the finest (if not the finest) 1967 Beetle Convertibles in the USA. David Brown, of Pennsylvania, supplied me with ideas and information from his extensive background with VWoA and his own independent VW career. He and I batted ideas back and forth in order to come to conclusions registered in this article. I thank Kevin Cook, who plied both Eric and me with bolt questions which we could not, off-hand, answer. We were spurred to do research which has, I believe, resulted in some basic conclusions. And, to my wife, Neva, and to our daughter, Janeva Sulman, I own a debt of gratitude for their patience with my photographic demands. Next: Next post: Happy Birthday, Grandpa! As always, I can’t thank Jay enough for his dedication to the ’67 Beetle community. Another great article. Thank you for this research. Appreciate the attention to detail and now I’m off to my bolt jars to see if I have any stray KAMAX or Ribe bolts in there from many years ago. Thanks! 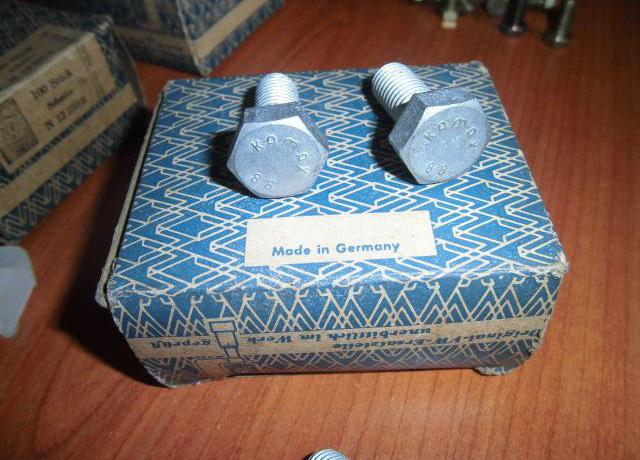 I did some rearch and it seems that Kamax was the fastener of choice for most VWs (all types) from the early 50s. The bolts by Kamax can be found on the bumper brackets, the undercarriage, suspension, and even the studs for the wheels. 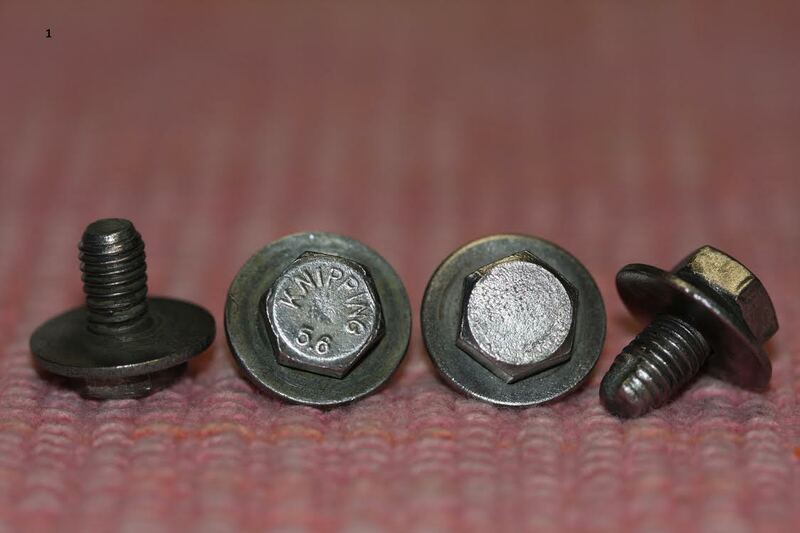 Kamax developed an relatively inexpensive process to turn out strong fasteners and were used by Fiat and others. Of course, the size of the bolt would vary according to the stress level. The ones you’re referencing were the correct size for the stress of weight, vibration, and temperature they would be subjected to. If someone wants to replace them (and they probably should if they’re corroded) and wants the new ones plated, they should be baked after plating to disperse any pockets of hydrogen. One could postulate/theorize that the common hardware bolts/nuts/washers were sourced “off the shelf” from the automotive/fastener industry. They were readily available and did not require Volkswagen to produce in house or contract separately for an item not already available-thus they do not carry the unique nine figure Volkswagen part number. The standard setting the specifications for these Standard hardware pieces was the German “Institute for Standardization” (DIN). These Standard parts are not necessarily unique to VW-as other automobile manufactures utilized them as well as the aircraft industry and industry in general. They were Standard items, if VW needed a hundred thousand dozens of a Standard item their buyers bought or contracted to buy off the open market. Perhaps Kamax was the main supplier in many ways and when they couldn’t produce the other companies were called up. One could easily surmise that a company as large as Volkswagen in the mid 1960’s required a passel of vendors for supplies. That is Why they are listed in the Volkswagen Parts Manuals as Standard Parts. 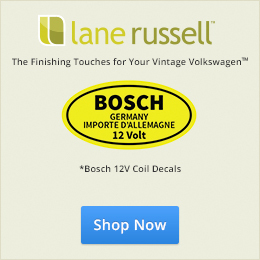 The master list of all Standard parts for a particular Type VW is found in the Standard section in the rear of the manuals and do not carry the unique Volkswagen Part Number. The Volkswagen part numbering/identification system as printed in the parts manuals is broken down into 10 units-beginning with the engine for number 1, fuel tank, exhaust, heating system for number 2 and continuing in numerical order through to number 9 for Electrical equipment and lastly for number 10 Accessories. Each part number within the 10 Units is Volkswagen unique made up of 9 numbers (except when a Standard Part is called for then it is the Standard N six numbered part). The N or Standard Parts were incorporated in the manual after the 10 VW part numbered units. Obviously neither the Standard Part number nor the DIN number calls for a particular manufacturer. Unclear as muddy water is who/where/what did the Standard parts, part number originate, was it issued by the DIN system or—? The Standard Part Number for the Coil Bracket bolts N 10 210 1 (N 11 695 2 Washers) and fan cover plate/generator mount (N 12 226 2 spring washers) as shown in the VW Parts Manuals and listed in the Standard section described as “Bolt, hex, head M 6 x 10 DIN 933. Galvanized”. DIN being the German “Institute for standardization”. DIN 933 specifies a fully threaded bolt. DIN 933 appears to cross to the modern ISO (International Standards Organization) 4017 which calls for grade 10.9 for galvanized? As the bolts in the discussion are 5.6 this standard has evidently changed under ISO. More applications for Part Number N 10 210 1. The inside door pulls/operating lever has two on each door (4). 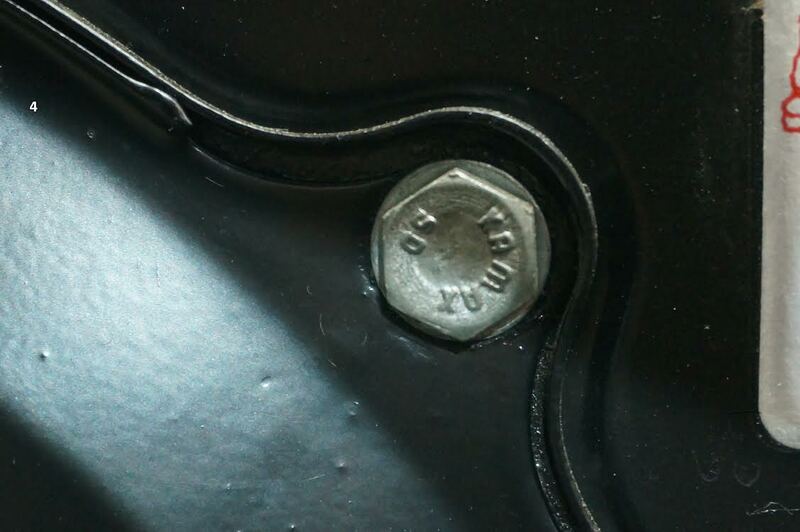 However the 4 washers for the door pull bolts are Not Standard parts, they are Volkswagen unique with the 9 numbered part number 111 837 941 described as “Concave washer 6.4 x 12.5 from Chassis No. 117 000 001”. The rear hood/deck lid hinge carrier/hood hinge has (4) (Spring washer N 12 226 2 And N 11 652 1 two for each bolt-most cars are probably missing one or more of these washers). Convertible Window rear channels left/right have one each (2) (N 12 006 2 Washers). Vent wing clamp that clamps bottom of vent wing, one each side (2) (Washers not Standard parts-VW 111 837 939 Concave Washer 5.3 X 12.5 galvanized). Cheese head screws Standard parts for the cooling tin N 10 710 1 (AM 6 X 10 DIN 84 galvanized) and N 11 652 1 (Washer 7 galvanized). These cheese head screws also secure the air flow regulators/cooling flaps inside the fan housing.